Over the last few years, constraint consensus methods have been used for the movement of infeasible solutions towards feasible space, when solving constrained optimization problem. 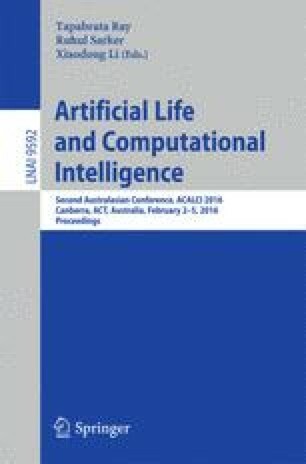 In this paper, a novel approach is proposed that is based on the concept of constraint consensus to improve feasible individuals, rather than infeasible ones, in which a feasible individual is considered as an infeasible one, if its fitness value is worse than a dynamic reference point. The obtained new solutions are then passed to differential evolution to be evolved. The proposed algorithm has been tested on the CEC2010 benchmark constrained problems. The results demonstrate better performance of the proposed algorithm, in terms of quality of solutions and computational time, in comparison with a standard differential evolution algorithm, as well as a set of state-of-the-art algorithms.